We are glad to inform K-meta users about regular updates in the capacities of our service! Now the stability of a number of tools is much more refined. Among them is the parser of sites, the improvement of which consequently has boosted the accuracy of the data obtained. Besides, we significantly amplified our filter module: now, for better keyword selection, you can use word filtering (to include or to exclude them from your list) with a limit of 100 in one click! Just upload your list of keywords to the form and click Update. We have earlier announced an increase of limits on the batch analysis of keywords, and now, following the numerous requests of our users, K-meta's project team has launched a new tool: the capacity to make a deep express analysis of a huge number of domains. This service includes the possibility to find out information about the number of keywords in the search both organic and advertisement, compare metrics for traffic and k-meta rank, estimate the spent budget of the entire package of domains you are interested in. Organic Traffic - the estimated number of visits to a given domain from the top 20 organic Google search results per month. Organic Keywords - a general number of top 20 organic Google search results taken by a given domain. Total organic results - the number of keywords with which a given domain is present in the top 20 organic Google search results. Results Distribution - the number of organic Google search results taken by a given domain on each of top 20 positions. Ads Traffic - the estimated number of visits to a given domain from Google Adwords search results per month. Ads Keywords - the number of keywords with which a given domain is present in Google Adwords search results. Total ads results - the number of advertisements that lead to a given domain in Google Adwords search results. Ads Cost - the estimated total cost of advertising for a given domain in Google Adwords. 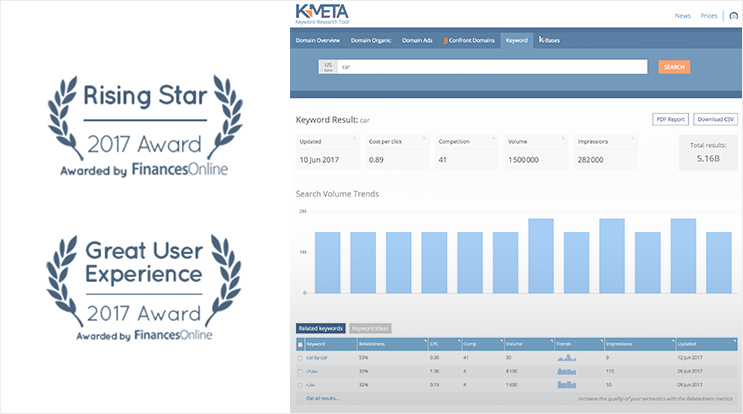 K-meta Rank - evaluates the amount of search traffic which a domain receives according to collected data. K-meta rank runs on a scale from 0 to 100. The higher the rank, the more traffic a domain receives. Quota for the number of domains varies based on the user's subscription plan and results can be easily downloaded to CSV. Thus, for example, holders of the Plus subscription can request 50 000 domains in one click! We guess that Batch analysis of domains will help you to quickly determine the list of your competitors and get the maximum of information in the shortest possible time. Every year FinancesOnline chooses a select few to grant the 2017 Great User Experience Award to business solutions that exhibit intuitive features resulting in a general positive feedback from users. K-Meta has been chosen this year as one of the best SEO software solutions in terms of usability. After an extensive testing of the keyword search and analysis interface, our tool proved easy for any user type. Our service helps you to optimize on-page SEO as well as discover your competitors’ SEO profile. On the other hand, the 2017 Rising Star Award is granted to software that, although relatively new in the field, has shown a potential to be a truly useful tool in its niche. We provide businesses an alternative keyword search solution with unique tools like batch metric analysis and in-depth SEO reporting. We hope that we have pleasantly surprised our users once again and our new functionality will make you much closer to the ideal strategy for the promotion of your project. Please contact us, If you have any questions, suggestions or proposals!